Despite a reboot, the world of Witchblade, Artifacts and The Darkness has been around for several years, which can make it hard for a new comic reader curious to catch up. 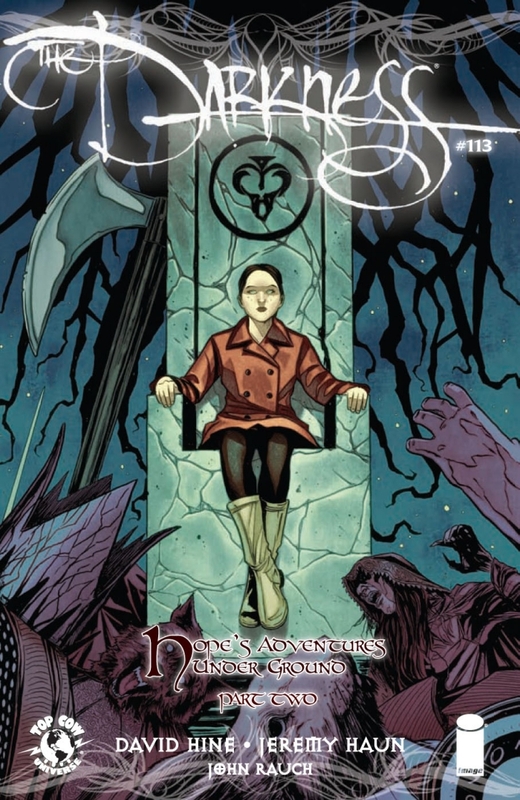 However, David Hine provides an out of the box issue for new readers to jump on board with The Darkness. 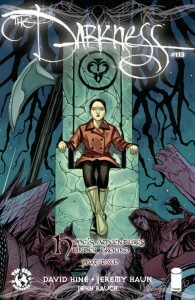 This issue focuses on the daughter of the man who used to embody the Darkness, Hope. In recent issues Hope has discovered that she also exhibits powers of the Darkness and has set off on her own. There are several things in this issue that make it a good jumping on point for new readers. The first is that the editor does a great job of summarizing a rather complicated storyline, that reaches back years, onto one page, filled with visuals. The second, is that this issue is more based around loose and familiar themes found in Alice Through The Looking Glass and less on the actual world of Witchblade. While parallels to the world of Alice are nothing new in any entertainment medium, the level of cruelty and horror used here is interesting. If you’ve never read The Darkness before, you should be aware that the storyline does not always draw such literary inspirations and has its own rich storyline. That is something that The Darkness series is constantly good about, creating a world that has elements of its parent series, Witchblade but not making it dependent upon that series to exist. It’s not a comic to read to get a feel good feeling, but one to chew over, full of unique perspectives and a different type of story. While there is plenty of action here, very little of it is on Hope’s part. Unlike the previous issue, where Hope seemed to be more powerful or clever, here she is more of a pawn in the story. Jeremy Haun’s art is not he clean or polished feeling that is traditionally seen in a Top Cow book; and that is refreshing. The heavy inks, use of silhouette and frightening visages (along with other body parts) create full on creepy crawlies going down your back. Along with John Rauch’s muted colors, highlighted with greens, it gives the book almost an independent feeling; once you get past the first few pages. Haun’s art is also key in understanding the plot points that will come back to haunt Hope in future issues. This book constantly made me go back and draw comparisons to other materials, which was somewhat distracting. It made me think about previous issues of The Darkness, literary references as well as art styles found in contemporary books. While this type of debate about a book can be fun, I did not like that constant reminder while the reading process was occurring. The gem at the end of this book was a short story at the end by author David Hine, which is about Hope’s dream after her misadventures. After reading the book, you can picture the characters drawn in Haun’s style and with the same shading as a book. It’s also easy to see what Alice characters new people in the story represent. It was fun and whimsical, while dark and disturbing. Despite its lack of importance, to the plot going forward in this series, I do wish this epilogue had been drawn out.